Only 21% of European datacentre managers have taken actions to address the European Commissions’s 20-20-20 Renewable Energy directive. Almost half of European datacentre professionals (43%) are unaware of the energy efficiency targets, according to a research report from Emerson Network Power. The European Commission (EC) set out a directive in 2007 to ensure EU countries meet ambitious climate and energy targets by 2020. These targets, known as the "20-20-20" targets, set three key objectives for datacentres by 2020, including: a 20% reduction in EU greenhouse gas emissions from 1990 levels; increasing the use of renewable energy sources to 20%; and improving energy efficiency in EU countries by 20%. The targets are designed to transform Europe into a highly efficient, low-carbon economy. “EU 20-20-20 directive is going to have a lasting impact on datacentres, and despite the deadline still being eight years away, IT professionals have to act now,” warned Emiliano Cevenini, vice-president of power sales at Emerson Network Power in EMEA. While 36% of respondents were aware of the targets, they admitted that they had not done anything to their datacentres to meet the EU targets. Only 10% of these said they plan to take some action in the next three years. The study of nearly 400 European IT professionals found only 57% of those who were aware of the targets procured more energy-efficient IT equipment. Of IT executives familiar with the requirements of the EU legislation, as many as 63% said they are concerned about the effect the directive will have on their datacentre operations. Almost three quarters (72%) also indicated that energy efficiency is one of the most important criteria when purchasing datacentre products. But this was more usually done to save on power costs or because it was part of their company’s own green initiatives, rather than to meet the EC targets. 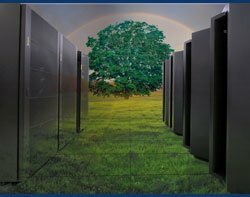 In order to help datacentre professionals meet the 20-20-20 targets, the EC has released a voluntary Code of Conduct on Data Centres Energy Efficiency. The document focused on datacentres because the electricity consumed in these IT facilities contributes substantially to the electricity consumed in the EU’s overall commercial sector. For instance, in 2012, power requirements grew by 63% globally to 38GW (gigawatts), up from 24GW in 2011. An Ovum report found datacentre energy efficiency will be IT’s top priority for 2013. It is hard to determine which lever is pushing the energy efficiency agenda harder in organisations, rising costs or corporate responsibility. But alignment with the EC 20-20-20 directive is forcing businesses to take a stance on energy consumption and environmental responsibilities, Cevenini said. While having a green datacentre is part of many European businesses’ IT strategy, the Emerson study found hesitation among some IT professionals to move to alternative energy sources to run their datacentres. Cost implications (48%) and complexity (38%) were cited as the main barriers.